Together again after so long apart! Two years ago, ISIS swept across Iraq, capturing city after city. One day, militants arrived at Abraham’s hometown. He was away at the time, but his parents, wife, and baby girl were there. His entire family came under the shadow of ISIS’s self-proclaimed caliphate, oppressed and out of reach. 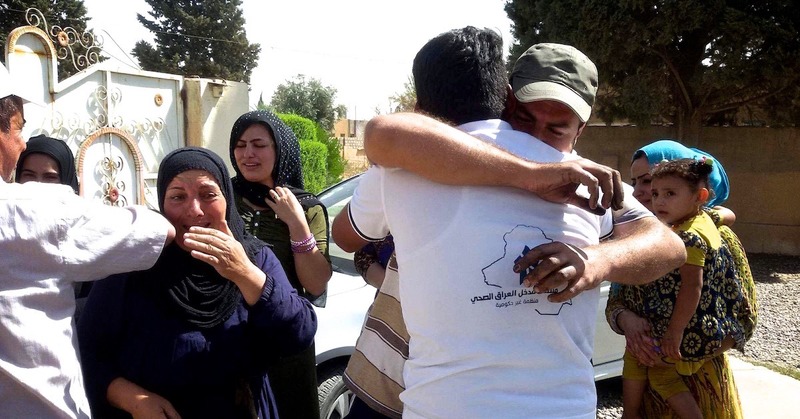 ISIS consolidated its grip, making it impossible for Abraham return or even see his family. Sadly, there are lots of people with stories like Abraham’s. One of our colleagues compared the situation in Iraq to when the Berlin Wall went up in Germany, separating loved ones from each other overnight. Can you even imagine your home, your family—everything you know and love—being captured and held by terrorists for years on end? Iraqi forces just ran ISIS fighters out of Abraham’s hometown. He was one of the first to return, and we were there to witness the joyful reunion with his family. Holding your wife and baby girl for the first time in years—homecoming! You were there, too. Your love was in Abraham’s home and a thousand others, in the form of recovery kits full of medicine, handmade soap, food, and other essentials. Families who had been separated or starved out are finally free. At last, they’re able have a fresh start. Unlike other recently liberated cities, Abraham’s town sustained little damage. The fact that ISIS barely put up a fight here shows just how weakened the militant group has become as they’re pushed closer and closer to their Iraqi capital of Mosul. The road to Mosul will be long, and there will be many more families like Abraham’s. Thank you for standing with them. Liberation is coming! Will you be there to make sure families land on their feet?